Better than take out chicken fried rice. I love, love, love good fried rice. Not the dried out stuff that you often get in Chinese restaurants that you have to douse in sweet and sour sauce to eat, but the fresh, sticky, homemade kind filled with fresh vegetables and sweet pork or moist chicken. This recipe is so simple and easy. I made it with chicken but it would be excellent with BBQ pork as well. Making your own allows you to know exactly what is put into it- how much oil, no preservatives, etc. You can also add whatever you like. Not a fan of peas? Leave them out! Like mushrooms? Bam! Add some! 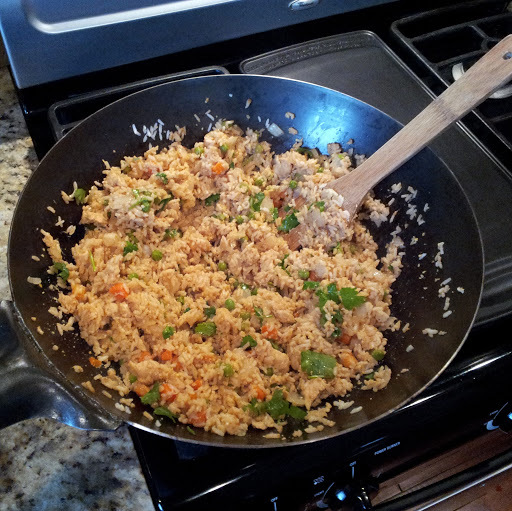 Fried rice is easiest to cook if you make the rice the day before and let it sit overnight in the fridge. At the very least, cool it completely in the fridge before you start cooking. Heat sesame oil in a large skillet on medium heat. Add onion, garlic, peas, and carrots. Stir fry until tender. Crack eggs into pan and scramble, mixing throughout vegetables. Add rice, chicken, and soy sauce to pan. Stir in soy sauce and oyster sauce, and mix through. Then, remove from heat and enjoy!